Tuesday morning, we woke to similar weather. Cool and pleasant for some, but a bit chilly for others. After the afternoon heat from the Monday, nobody was complaining. We headed down for the flag-raising ceremony and the troop seemed to be rocking along like we've been doing it for years. Later, we discovered that several of the first-year Scouts had left important items back at camp (swim suits, towels, water bottles, etc). The walk back to camp is what some consider to be a day hike, so we'll see if this lesson is learned on Wednesday. ...to honor America by raising the flag. At breakfast, we enjoyed scrambled eggs, bacon, and biscuits. There is also an option for cereal and fruit. Everyone got a good breakfast and headed out to their daily activities. The merit badge sessions for Tuesday were the same as Monday's. 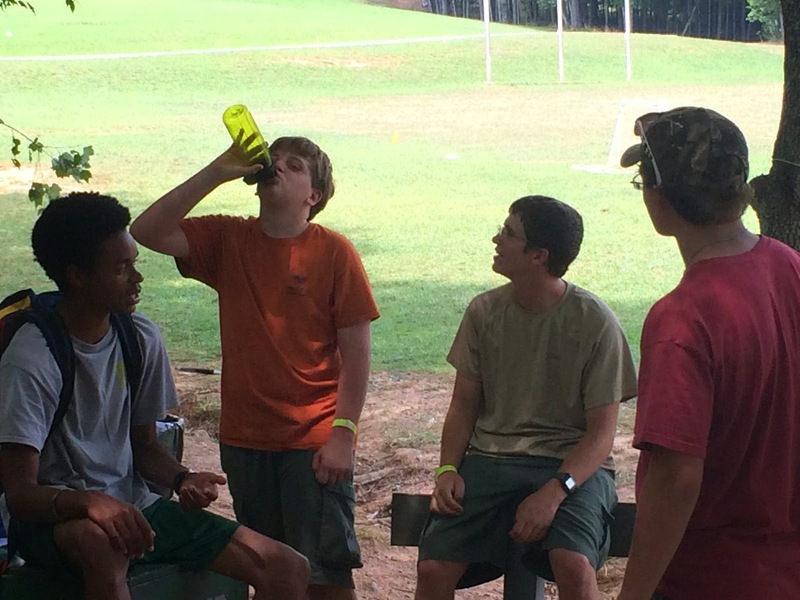 First-year Scouts attended the Mountain Man program along with Swimming and First Aid merit badge classes. 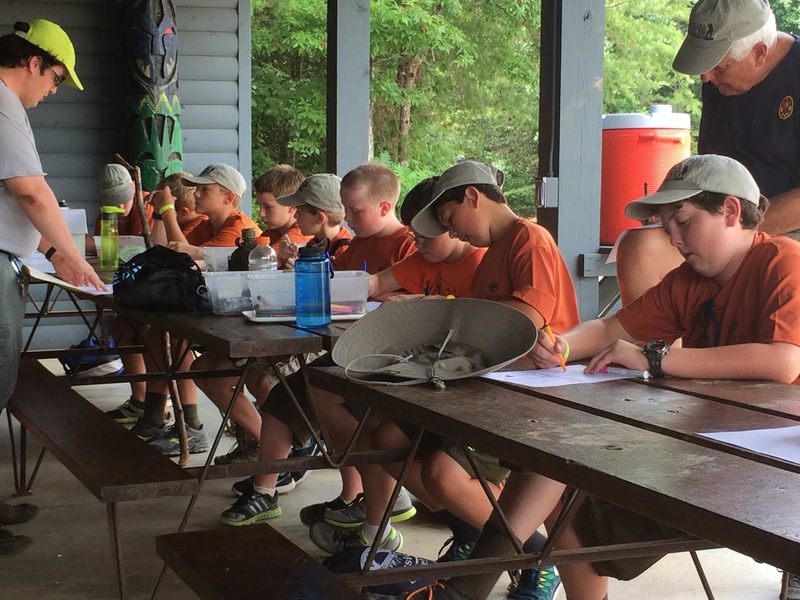 Veteran Scouts worked on merit badges like Camping, Kayaking, Archery, Communications, Personal Fitness, and Fishing. Louie finished up his Horsemanship Merit Badge with an exciting off-site trip to ride horses. Andrew and John continued to spend most of the morning at the COPE course. Michael hydrating himself during a break from Personal Fitness. Everyone gathered back for lunch consisting of soft tacos, rice, and vanilla pudding. A few opted for PB&J, but most ate the tacos. After lunch, a few Scouts earned Art Merit Badge during a special session scheduled by Assistant Scoutmaster Wes Williams. Later in the afternoon, a few Scouts and leaders headed out to the Davis Inn, which is a former homestead a short hike from camp. At the Davis Inn, you can see how people lived in the mountains in the 1920s. There are several things to see at this former home, such as a blacksmith, a gardener, several chickens, and tomahawk throwing. Mr. Williams helps lead Art Merit Badge. Mr. Pendleton with Andrew and Will near the Davis Inn. 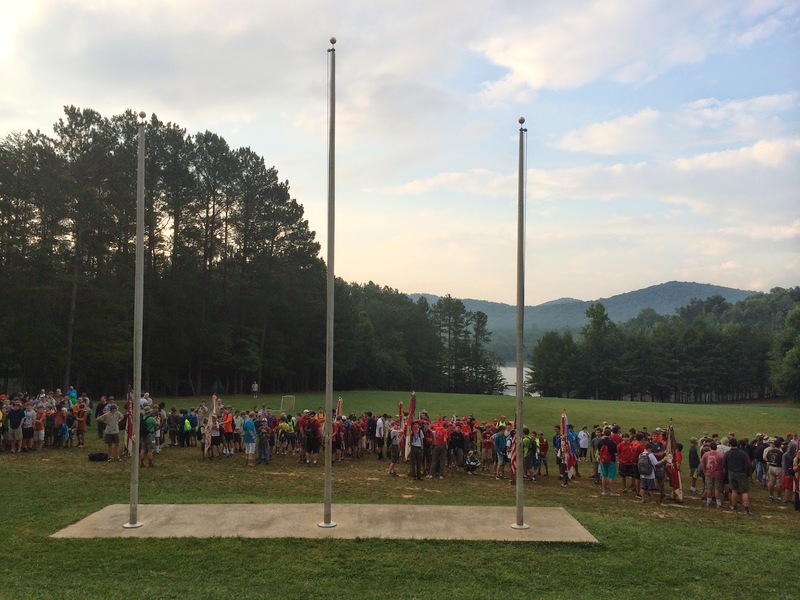 The troop gathered again for the closing flag ceremony before dinner after a busy day of classes and free time activities. We enjoyed some type of steak and gravy with carrots, mac and cheese, and rolls. Ice cream was a great treat for dessert. After dinner, we were scheduled to give mountain boarding a try, but a pretty loud and wet thunderstorm prevented this. A few boys were able to do some mountain biking instead. Mountain boarding was described to us as something similar to a surfboard with large tires that you ride down the mountain. Hopefully, we can check this out later in the week. Joe mopping the floor for some extra cleaning that was needed. The storm stuck with us for quite a while, but has now passed and it is quiet for the evening. Some clothes and towels on the line are now wet, but otherwise spirits are high and things are for the most-part dry. During the rainstorm Joe, Ethan, and Jason helped out in the dining hall with some additional cleaning that was needed. They were rewarded with ice cream and cake. 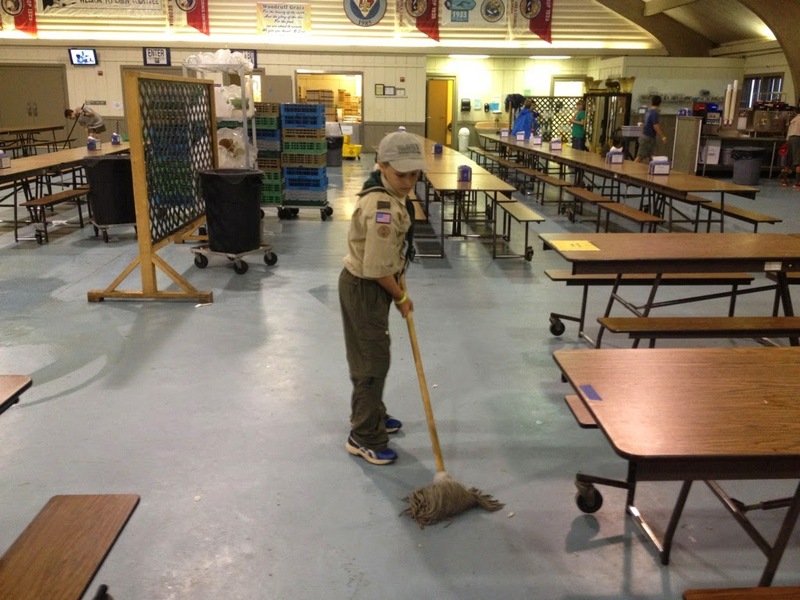 What a great example these Scouts are setting! The Scouts spent the evening socializing and playing various card games before getting their daily showers and heading to bed. Tomorrow, several big items will occur. First, we will be saying goodbye to Assistant Scoutmaster Williams as he heads back to Auburn. We will all miss him, but especially many of the first-year Scouts with which he has spent so much time. 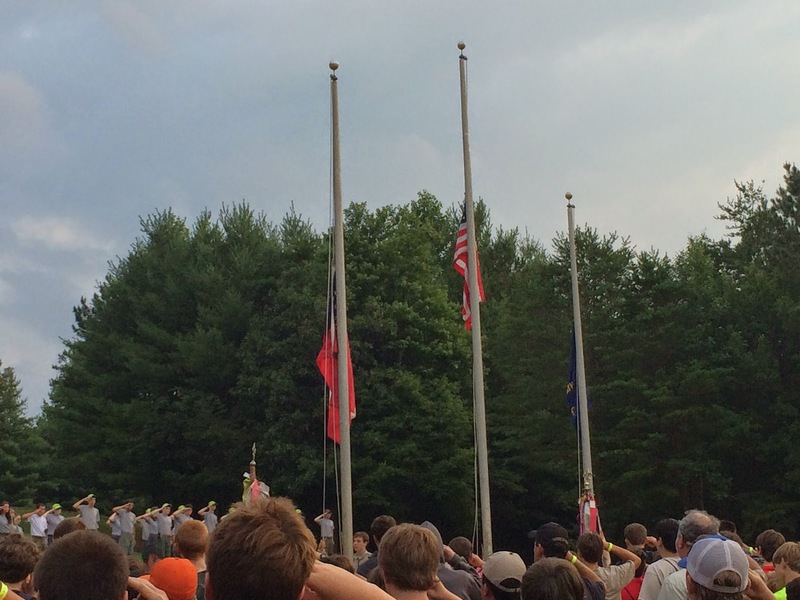 About the time of his departure, the troop will leave camp for the first time to raft the Nantahala River. We'll take a bus up to North Carolina and enjoy lunch and rafting the entire afternoon. This should be a great experience for everyone! To see pictures from Day Three, check out our online photo album.